Google Website Optimizer, the free multivariate and AB testing tool makes available to you two results reports when you are running a multivariate test; the Combinations report, and the Page Sections report. 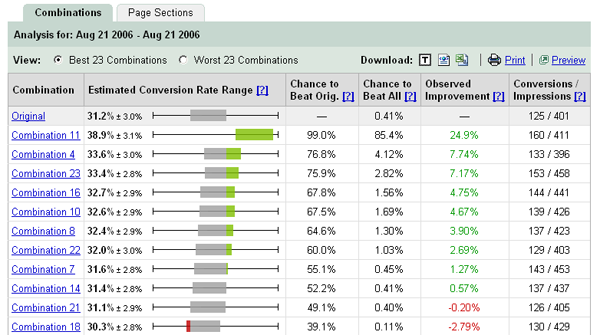 The Combinations report is easy to read and interpret for the most part (for simplicity purposes here, the pages are listed in order of best performance, and a statistically significant winner with a 95+% confidence level over the control will be highlighted in green), but the Page Sections report many people incorrectly use the data that is presented or are confused on what the report is actually providing. You MUST know how to correctly interpret this report; otherwise you could incorrectly make decisions from the data that can cost you potentially big-time down the road. The Combinations report provides you with the performance data for all of your page combinations that you are testing and compares each page combination to your original page (the control) in order for you to determine what test page combinations are outperforming the original. The Page Sections report on the other hand displays all of your page sections that you are testing and the elements within each section in order to show you the best performing page element for each particular section. Here is the scoop on the Page Sections report. Many times, when you are running a test you will notice that the best performing elements according to the Page Sections report are not the same elements that are present in your winning page combination. It’s not as simple as looking at the different sections and choosing all the “best” elements according to Google Website Optimizer Page Sections report and then rolling out a page that contains these elements. The reason being is that the performance of the elements in each section being tested as shown in the Page Sections report are not being calculated and presented in context with the other sections. By this I mean that the results of each element in each section are presented by how they performed against the other elements in that same page section. It’s not taking into account the context of all the other elements on the page when showing you the best performers. To see which the best elements are in proper context, view your Combinations report and look at the individual elements in your top performing page combination. And the report shows that test headline # 1 is the best performing element in that area, it’s only reporting to you that between those 3 headlines, headline #1 is the best performer, but it is not taking into consideration how it interacts with the other elements on the page. It’s not saying that for the page you are testing, headline #1 is the best to use for the roll-out page, but instead – between those 3 headlines, headline #1 is the best performing if you are comparing just the performance of the headline itself. Headline #1 might perform the best out of the 3 headlines when compared to each other out of context with the rest of the page elements, but Headline #2 might perform the best in combination with all the other elements and therefore is the one you want to roll out with (but not necessarily reported this way in the Page Sections report). So please, don’t use the Page Sections report to pick out which elements to roll-out live with. The Relevance Rating graphic (currently found to the left of each page section), alerts you to how much impact each section had on your test (as defined by your test’s conversion goal). It’s presented as a range, from 0 to 5, with 0 representing that the section had virtually no impact on conversions and a 5 as having a high impact on page conversions. 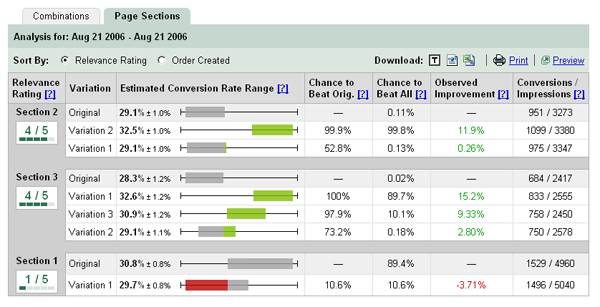 So while the Page Sections report is important to look at to understand what is happening between the different elements in the page sections themselves, and the Relevance Rating is important to look at to understand what page sections are providing what level of impact to page conversions, you should ideally only use this information to help you gain more insights into the test. Insights that will also give you further help in planning future testing of the page. However, you will only want to roll-out the panel that is deemed the best performer according to the page Combinations report. Of course this is after you finish running your head-to-head follow-up test between your control and the best performing page combination to verify your results outside of the multivariate testing environment!